RIO DE JANEIRO, BRAZIL – Cambridge, Massachusetts, home to Harvard University, is over 7,700 kilometers from Brazil’s most populous city, São Paulo. Since 2006, however, that distance has not mattered much, as Harvard has a permanent presence on the city’s main commercial strip, Avenida Paulista. 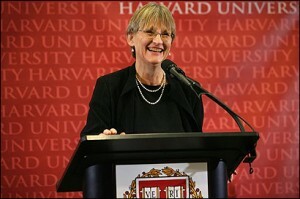 Drew Gilpin Faust, the 28th president of Harvard University, photo by Dina Rudick/Boston Globe Staff. Jason Dyett, Program Director, sees the strength of the Harvard Brazil Office in the way it complements the university’s activities in Cambridge. “It is a university-wide initiative, and so able to take advantage of any topic, including cross-disciplinary problems,” he explains. Examples from this year alone include Portuguese language instruction with volunteer work in a disadvantaged community in Florianópolis, a public health course on infectious diseases in Salvador, and public policy internships in São Paulo and Brasília. Harvard programs are particularly active in Rio de Janeiro, including a January joint course between Harvard’s School of Engineering and Applied Sciences and the Universidade de São Paulo’s Escola Politécnica on engineering the urban environment. There was also a July-August Brazilian culture and Portuguese language program hosted at Pontifícia Universidade Católica do Rio de Janeiro (PUC-Rio), an urban design studio on the neighborhood around Maracanã Stadium, and an immersion program through the Harvard Business School that includes a two-day visit to Petrobras University. In March, Harvard University President Drew Gilpin Faust traveled to Brazil for the first time, making stops in São Paulo and Rio. She gathered with alumni, visited the Harvard Brazil Office, and met with officials from leading Brazilian universities. Harvard University staff at its office in São Paulo, photo courtesy of Harvard Brazil Office. Harvard has also actively recruited Brazilian professors, such as Nicolau Sevcenko, currently head of the Brazil Studies program, who arrived in 2009 from the Universidade de São Paulo (USP). Bringing Sevcenko to Cambridge was quite a coup, as he was known on the USP campus as “O Famosão” (the famous one), a highly-regarded cultural historian. From renowned professors to a growing number of young Brazilians eager to study at one of the world’s most prestigious universities, as well as students eager to study one of the world’s most dynamic countries, the Harvard Brazil Office serves as a vital link between country and university.